Though she was using a lot of sound marketing principles on her site, the main conversion-focused areas were hard to see among all the red, and her incredibly fun, fierce and hilarious personality wasn’t visibly being represented on her site either. For Michelle’s re-brand, we focused on making Michelle, the rebel that she is, the star of the show! 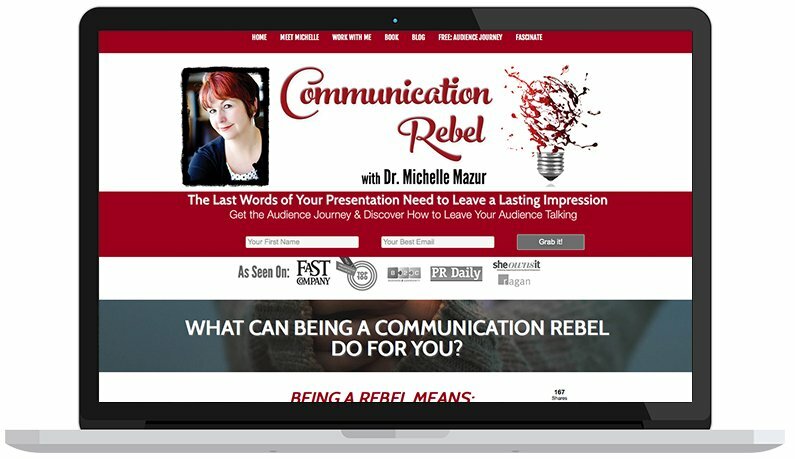 Her photo of pure expressiveness, confidence and energy take center stage to truly embody “communication rebel” in the way that onlookers only wish they had that much confidence and clout in front of their audiences. A handwriting marker font adds a sense of grit and personality to the page, as does the exposed and distressed brick. Red, black and white colors are used sparingly for pops of color and interest, and a teal blue is also used since that’s in the majority of her photos. Michelle was BEYOND fun to work with, and it’s been so exciting to hear all about how her business has changed since re-designing her website, and all the opportunities she’s experiencing. It’s these kinds of “before and after” stories that inspire me and the work that I do, and bonus? I got a pretty awesome friend outta this, too.